Different Strokes is ABMP's member newsletter, now delivered to you within each issue of Massage & Bodywork magazine. 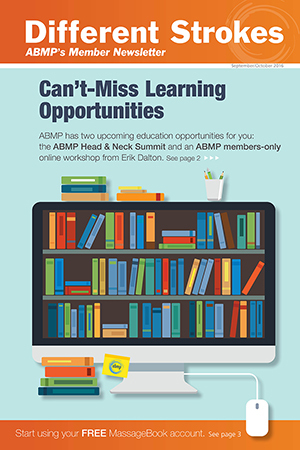 Filled with information about member benefits, tools you can find on ABMP's website, ABMP member profiles, and a list of current 10- and 20-year ABMP members, Different Strokes is an easy read you shouldn't miss. Questions? Contact us at differentstrokes@abmp.com. March/April - What do your clients say about you? September/October - How's Your Customer Service?